Japanese shrines are impressive, but there’s a sense of “you’ve seen one, you’ve seen ’em all.” Small, local shrines are everywhere. However, the history of these shrines is still inspiring and the major shrines can be overwhelming. Not surprisingly, the tradition is still celebrated throughout Japan. One of the largest celebrations—and wildest—is the Shinto celebration of Sanja Matsuri (Three Shrines Festival) in the Tokyo district of Asakusa. 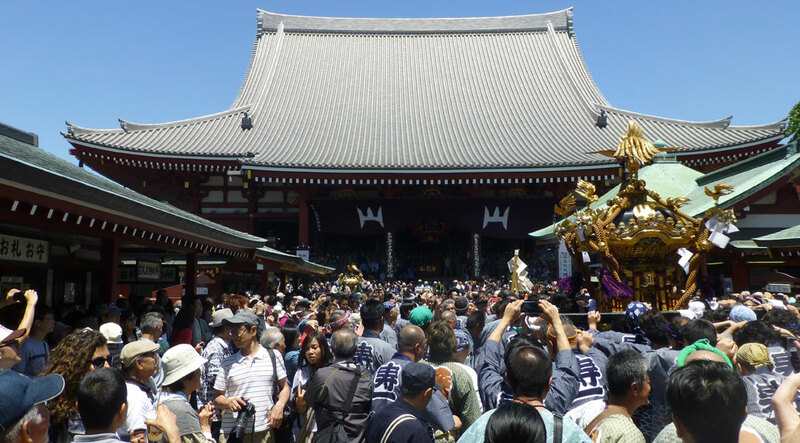 An estimated two million people visit Asakusa during the festival weekend to watch locals carry portable shrines, or mikoshi, through the district’s streets. We set up shop at Hōzōmon Gate. 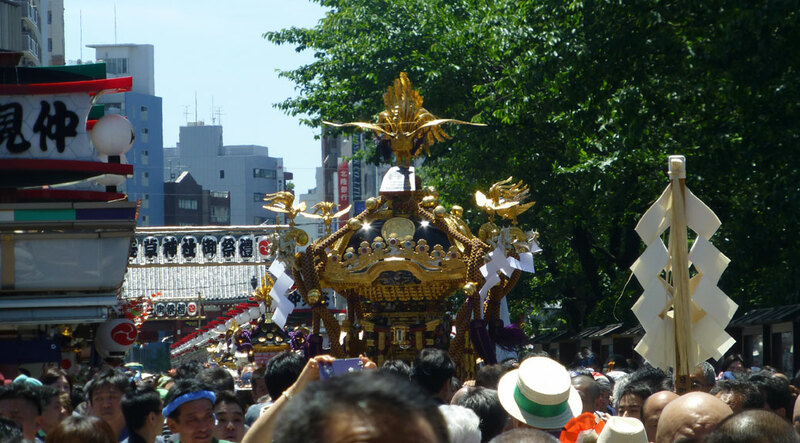 From there, we could watch as the mikoshi were carried up Nakamise-dori, the main street leading to the temple. Each mikoshi is ornately decorated with gold sculptures and wood carving. We were there on Saturday, so we missed the three large shrines carried on Sunday, but those shrines cost approximately $400,000 each to build. These aren’t your usual weekend parade floats. Shrines are carried up Nakamise-dori toward the main temple. Approximately 100 mikoshi are carried through Hōzōmon Gate on Saturday. They stop briefly at the gate to pay respects to Kannon, the Goddess of Mercy. Those carrying the shrines shake and rock them to energize the kami seated within the shrine. 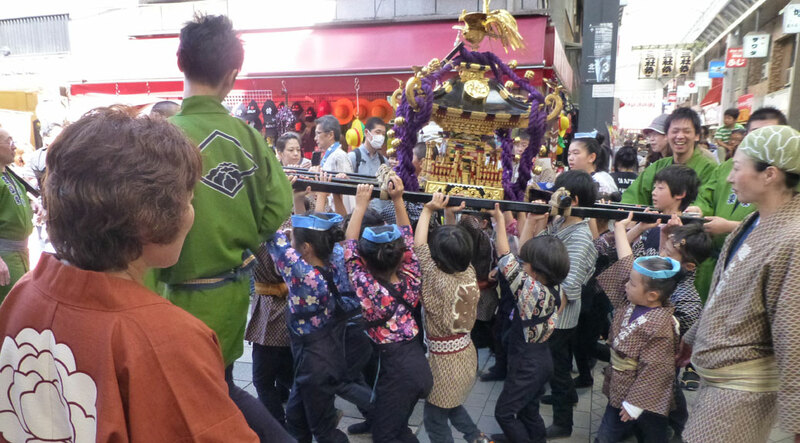 Even the kids are involved, lugging a heavy shrine around town with a little less excitement than their adult counterparts. 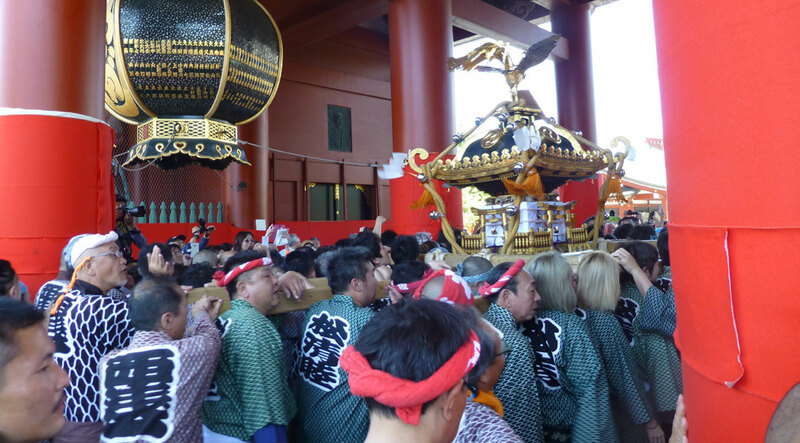 The mikoshi are then carried to Hondō where they are blessed by Shinto priests before being paraded through the 44 neighborhoods of Asakusa. The video below captures the energy of the parade. You can hear them chanting Soiya! Soiya!